""Bernard Stiegler grasps the décadence of our democracies. New industrial (informational) technologies, harnessed by out-of-control capitalism destroy collective memory: creating a crisis of belief, a disintegration of symbolic (and financial) credit. Yet, there is exciting political potential for emerging socio-technical formations. Stiegler is our twenty-first century public intellectual."" 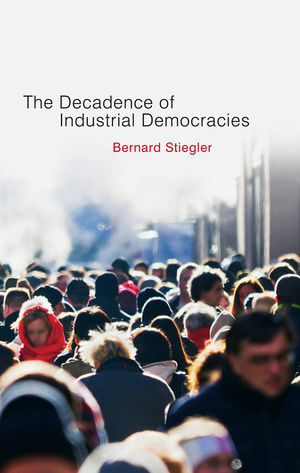 ""The Decadence of Industrial Democracies extends Bernard Stieglers relentless remapping of hyperindustrial modernity. It is a key text for anyone who wishes to understand the link between today's telecratic politics of memory and whatever transformations stand beyond it. It demonstrates that Stiegler is not just the radical thinker of technics but also the genealogist of cognitive morals."" Stiegler is one of the most original and important philosophers and cultural theorists in France today. His work is at the interface of philosophy and technology, so would appeal not only to those studying Philosophy, but media and cultural studies, and literary studies. He argues here that the industrial model implemented since the beginning of the twentieth century, a model based on the separation of production and consumption, has become totally obsolete, leading capitalism and the democracies where it has developed into an impasse. Polity has made a substantial commitment to the translation of Stiegler's work. This book is the first volume of a trilogy and the remaining volumes will be published in the course of the following year.